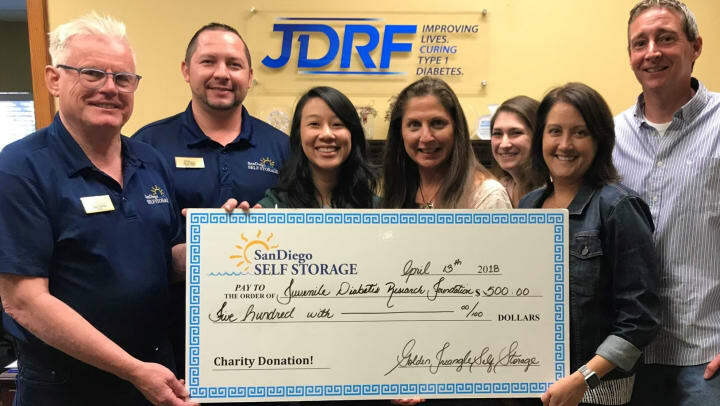 On Friday, April 13th, the team at Golden Triangle Self Storage (GTSS) presented a check for $500.00 to Juvenile Diabetes Research Foundation (JDRF), their charity of choice for 2018. Pictured from left to right: Greg Gamble and Dave Haller from GTSS, and from JDRF, Thu Le, Cindy Lang, Zoey Mirsky, Deanna Kasper and Sean McParland. The local San Diego chapter for JDRF is located about a mile from the GTSS facility. After the team learned more about what JDRF does and how the organization serves San Diego, it was an easy decision to provide this year’s donation to the Juvenile Diabetes Research Foundation.